In fact, Hombourg is on the edge of many borders. It is just south of Maastricht, in the Netherlands and just west of Aachen, Germany. 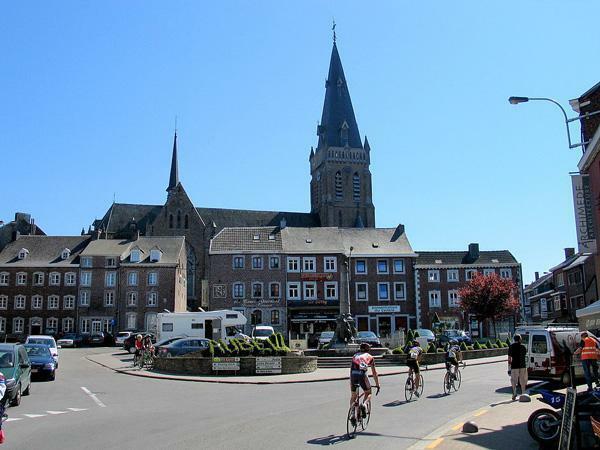 Hombourg, although part of Wallonia, is also only 30kms from the Flemish border. All this makes for an interesting blend of cultures, languages and history. As we wound our way towards Hombourg on the country roads of the Eastern Cantons, we came across a sign that made us do a double-take. We decided to investigate. Not far down a little side road, we discovered a small but well-maintained monument, the Canadian Memorial of Tigelot, in Jalhay, Belgium. 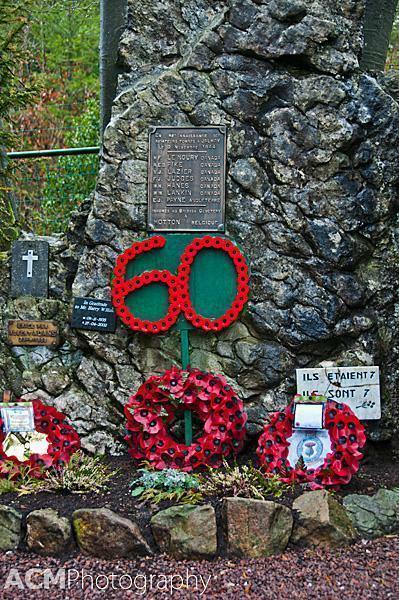 The site commemorates the six Canadian and one Scottish soldier who were killed when their plane was shot down during WWII. The crash was witnessed by a Jalhay land-owner, Mr Albert Adans, and his family. When the mother of one of the soldiers, visited Belgium, to see where her son was killed, she spoke with Adans about constructing a memorial. He did so in 1951 and the site has been carefully maintained since. In fact, there is even a Facebook Page, maintained by the great-niece of one of the soldiers, detailing the story of the site. 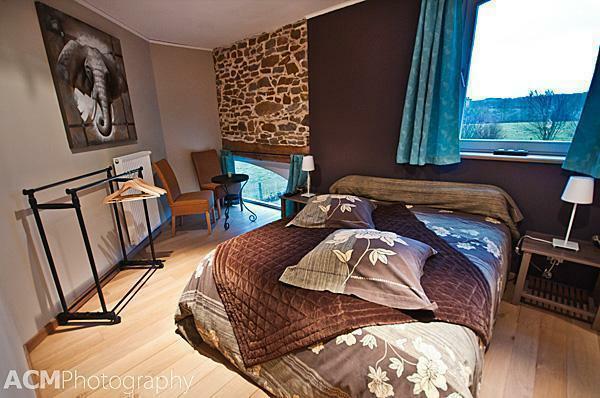 After our historical detour, we found the lovely Plaisir d’Etre B&B, in a beautiful converted farmhouse and barn. Plaisir d’Etre is more than just a Bed and Breakfast; it is also a day spa, with packages available for ‘Wellness Weekends.’ Sadly we didn’t have time to enjoy the spa, but we hope to someday soon. We were greeted by our lovely hostess, Anne-Marie, who gave us our choice of the three lovely rooms. (Once again we had the entire place to ourselves.) We opted for ‘Bonheur des sens’ as we thought our senses could do with a little happiness. The room was decorated in earth tones with a touch of Mediterranean blue and received plenty of light from the big windows. 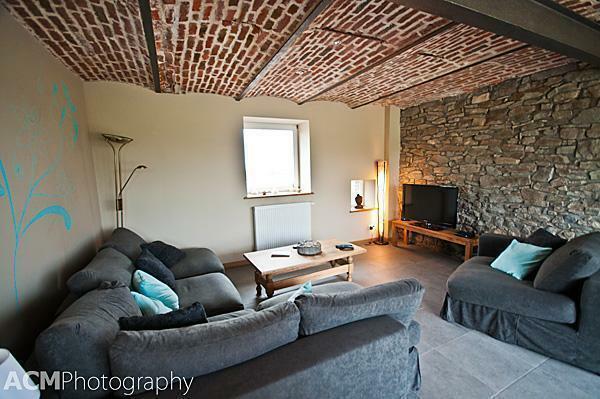 I loved how the original wood beams and stone exterior wall gave it a rustic yet cosy feeling. 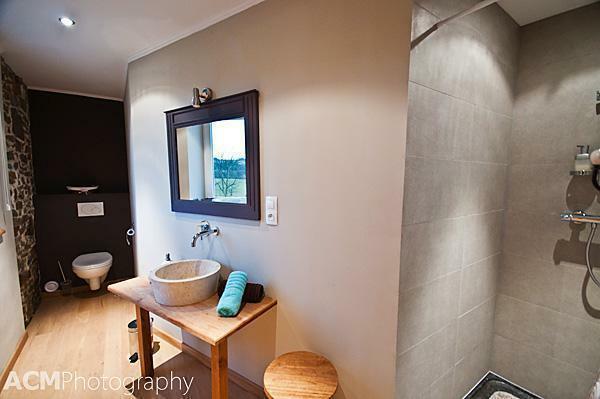 The bathroom was long and narrow with a beautifully unique stone sink (the sinks in all of the rooms are different but equally lovely). The rain-shower had plenty of water pressure, just the way we like it. The three rooms would be perfect for a family getaway, as they all open into a central stairway. There is a very spacious dining-room and living-room combination on the ground floor with a large TV and a very comfy sofa. Guests also have access to a small kitchen with a sink, microwave, coffee and tea facilities and a gigantic fridge stocked with snacks and local beers at very reasonable prices. We relaxed for a few hours before setting out to see about supper. Unfortunately our first restaurant choice, Le Cochon Embouteillé (Bottled Pig), recommended by both our B&B hostesses that weekend, was fully booked. After consulting Trip Advisor, we opted for Au Vieil Aubel, in the neighbouring city of Aubel. The Vieil Aubel Restaurant is in the city’s oldest building. Its brick and timber frame exterior look exactly as they have for hundreds of years. 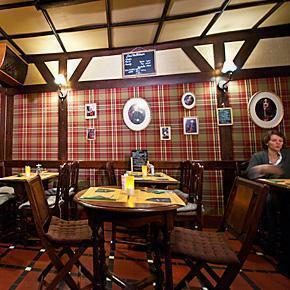 The interior has been modernised somewhat but still retains a quirky, old-world charm. I particularly loved the portraits hanging on the walls whose heads had all been replaced by various dog breeds. The food is old-school too. This is no place for vegetarians. There was only one salad on the handwritten, chalk-board menu and it featured bacon (considered a vegetable in much of Europe). The lightest dish was a brochette of scampi in butter. Luckily we left our diet regimen in Brussels for the weekend. Andrew knew what he was having before he sat down. 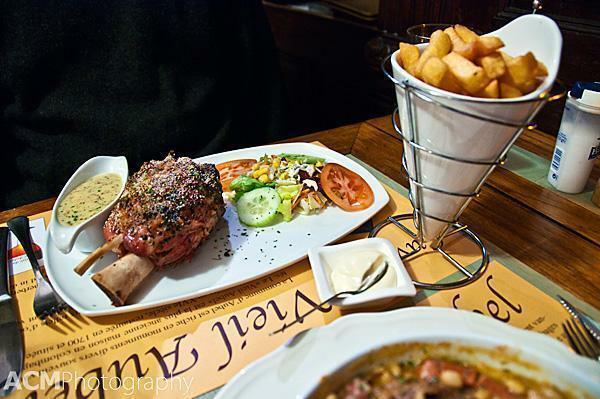 He had spotted ‘jambonneau,’ or pork knuckle, on the menu outside – his absolute favourite meal. 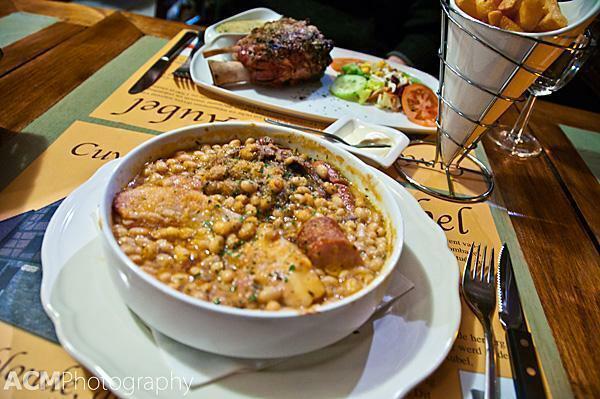 I opted for my favourite cold-winter French meal, cassoulet, a stew of white beans, confit duck and a variety of sausages. Essentially a heart-attack in a bowl, but at least I would die happy. The food was as far removed as you could get from our meal the previous night, but it was still wonderful. Andrew also sampled the house beer. The Cuvée du Vieil Aubel is brewed at the nearby Brasserie de l’Abbaye du Val-Dieu and is only available in the restaurant. Luckily they were persuaded to sell Andrew a few bottles to take home as well. Fat and happy, we returned to Le Plaisir d’Etre and fell into the second food coma of the weekend. Breakfast was once again, more than we expected. Anne-Marie served us a big basket of bread and pastries, yoghurt, a home-made fruit salad and a nice selection of meats and cheeses from the area. My favourite was the Vieil Aubel cheese (noticing a theme here?). Once again, we had a lovely chat with our hostess, who grew up in the area. We were surprised to learn that Aubel is primarily French-speaking and not German as we had assumed. Due to the proximity of the borders, however, you can hear a variety of languages when you are out and about. After purchasing some of the intriguing local beers in Anne-Marie’s fridge, we were on our way. Before setting off for home, we made one last trip to Aubel to check out the Sunday farmers’ market. It was much larger than we expected and the variety of produce and local products was impressive. We shopped quickly because of the cold but still managed to leave laden with bags of vegetables, cheeses and local meats. We even found some freshly made Chinese food to take home for supper. 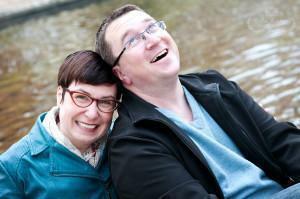 On our way back to Brussels, we both remarked on how surprised we were by our weekend in the Eastern Cantons. Despite the foul weather, we both had a lovely time. The locals were extremely friendly and accommodating, the towns are spotless, the countryside is lovely and the area is a heaven for foodies. We think this region is truly one of Belgian’s hidden gems. 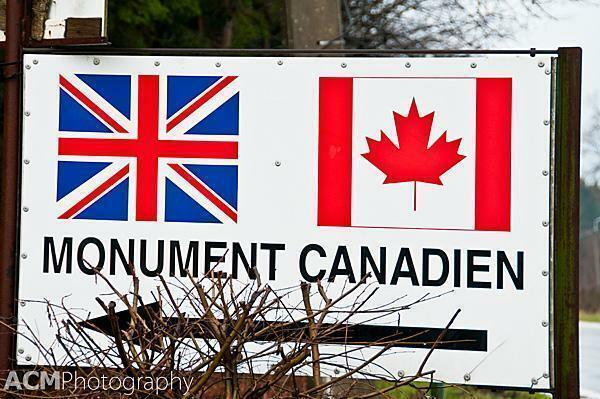 Go and visit soon, before the rest of the world figures it out.